Josh remarked upon how many bins there were on Massingham Street. And lo! Once you look, there’s no denying it! 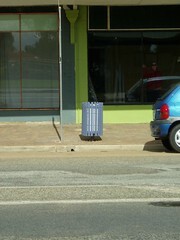 This has got to be the highest number of garbage receptacles per capita…of any town in Australia? Yes, let us claim that title for Kellerberrin, at least until some other tidy town wannabe makes an attempt to wrest the crown from our tidy tidy head. 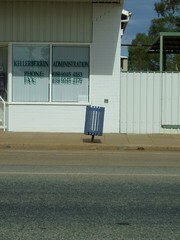 The Kellerberrin Bin Run, 2005. 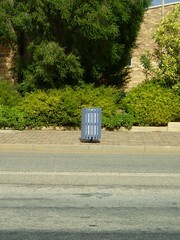 Bin 1: outside an empty building. 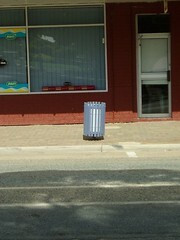 This is the main street’s most westerly bin. 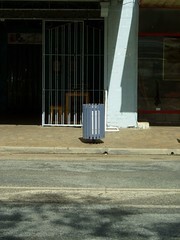 bin 2: outside the old Kellerberrin Cinema (now owned by Domenico De Clario and renamed The Aurora Project). 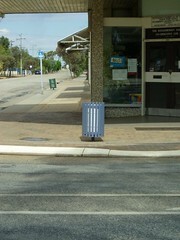 bin 3: outside the Post Office where I go to collect my mail from the taciturn Geoff. bin 4: outside the co-op. Here is where I buy my huge bottles of spring water, and where Rebecca books my train tickets to Perth. Nuthin to do. What you up to? Well, I said. 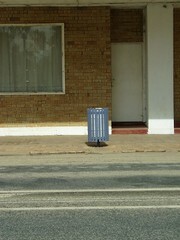 I’m taking photos of all the bins on the main street. Oh, ok, said Jeff. Alright. Catch ya later then. bin 5: outside the CDEP. I’m not exactly sure what this stands for. 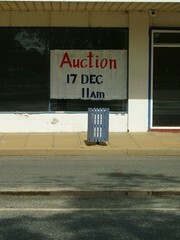 It’s an Aboriginal organisation, there’s a window display/shop, a furniture workshop and painting room. Reynold spent time chatting with us in here. bin 6: outside the tea rooms. Joe works in here. He makes a mean salt and pepper squid, and a top notch chinese green vegetable with garlic and ginger sauce. Joe sells eggs from his own chickens, and his fish n chips “do not lose” to Cicerello’s, that famous Fremantle chippery. 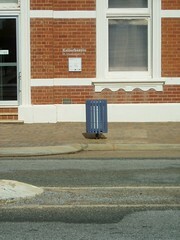 bin 7: outside the bank. 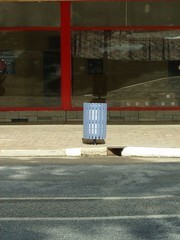 I go in here to withdraw money from time to time. There’s a nice young lad who works there, he’s always friendly. He gave me a little passbook and he updates my balance in it each time. bin 8: outside a place which used to be called “Legends” – next door to Betties. Late last week Bettie, in collaboration with Jo Debney, mended the hole in the front of my woolen vest. bin 9: outside the craft barn, which is my current abode. If you squint, you can make out Claire standing and waving from behind the glass. 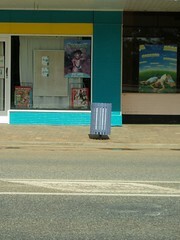 bin 10: outside the chemist. I don’t know the names of the folks who run the chemist. She is from Egypt, he is from Zimbabwe. They have some cute kids too. I always seem to need something right on closing time. At least it’s only 21 steps from my front door. 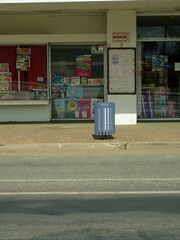 bin 12: outside the newsagency. One day when I went in there to buy a glue stick there was a woman dictating a very long classified ad for the deaths category in the West Australian. It was for Pado, the fellow who ran his car off the road not long ago. I waited patiently in the toy section. 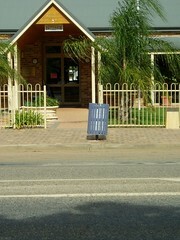 bin 13: outside the pub. This is where next Friday I am going to win the Jag the Joker jackpot and buy myself a new computer. 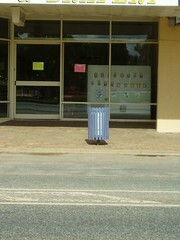 bin 14: outside the Kellerberrin Council Building. It is inside these hallowed halls that the great Stan McDonnell outburst of May the Seventh 2005 took place. I was lucky to be present at this momentous occasion. 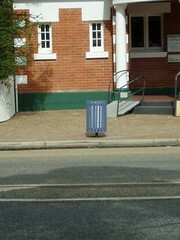 bin 15: outside the TAFE building. This is where David Blair teaches agriculture, I think. Bin 15 is the easternmost bin of the main street. I really enjoyed taking in this piece. CDEP: community development employment program, came into existence in the eighties I believe- in indigenous communities. it is interesting how the pictures give no sense of the spatial character of this town- but the text adds this, u set a tone through your notations/observations entiries- a friendly, casual involvment with the meet and potatopes of the community?! i like how streets (well for me ) translate to the magazine format, this work would be great as a published thing. I just loved this. I haven’t laughed so much for ages. Well done. IT WAS GREAT SEEING SOMEONE TAKE NOTICE OF THE BINS GREAT WORK. GOOD SITE, LOVE KELLERFELLER.